combination of iPhone charging stand & apple iWatch charging holder. charging adapter to power up. your Apple Watch and iPhone steadily with elegance, durability and fashion. 【WIDE COMPATIBILITY】: This charging stand is compatible with All Qi-Enabled Phones: Includes iPhone X / iPhone 8 / 8 Plus / Samsung Galaxy S8 / S8 Plus etc. Non-Qi enabled phones require a Qi wireless charging adapter to power up. 【TEMPERATURE CONTROL TECHNOLOGY】:This charging stand has temperature control , over current protection and over voltage protection all guarantee you a high quality wireless charger with Premium Design and Advanced Safety Features. 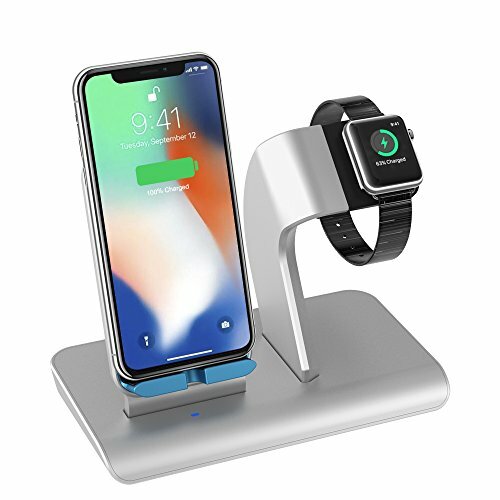 【PACKAGE&WARRANTY】: 1*Apple Watch and iPhone Charging Stand 1*Worry-free 30-days warranty can be applied for you to get full refund or replacement if you're not satisfied. Please feel free to contact us if any problems, our customer service team is always here. If you have any questions about this product by XDODD, contact us by completing and submitting the form below. If you are looking for a specif part number, please include it with your message.